Social isolation, loneliness, and suicide are conditions we often associate with the elderly. But in reality, these issues have sharply increased across younger generations. Baby Boomers, Gen X’ers, Millennials, and post-Millennials all report a declining number of friends and an increasing number of health issues associated with loneliness. Even more concerning, it appears that the younger the generation, the greater the feelings of disconnection. Regardless of age, it feels as though we’re living through a period of ongoing disequilibrium because we’re not able to adapt quickly enough to the social and technological changes swirling around us. These powerful changes have not only isolated individuals from their own peers but have contributed to becoming an age-segregated society. And yet we need fulfilling relationships with people our own age and across the generations to lead lives that are rich in meaning and purpose. Even in those rare communities where young and old live near each other, they lack organic settings that encourage intergenerational relationships. In addition, it isn’t technology, but generational diversity that is our best tool for navigating the changes that affect so many aspects of our lives - whether it’s work, entertainment, education, or family dynamics. We can’t restore yesterday’s model of community, where only those who were older transmitted wisdom downward to the generation below. But we can relearn how much members of different generations have to offer each other and recreate intergenerational communities for the 21st century where young, old, and everyone in between is equally valued for their perspectives, and where each generation views itself as having a stake in the other’s success. 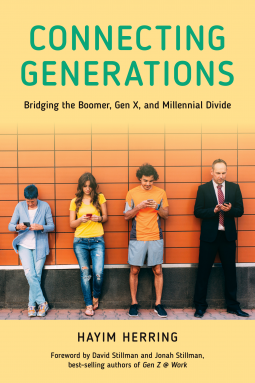 In Connecting Generations, Hayim Herring focuses more deeply on how Baby Boomers, Gen Xers, and Millennials perceive one another and looks underneath the generational labels that compound isolation. He offers ways we can prepare current and future generations for a world in which ongoing interactions with people from multiple generations become the norm, and re-experience how enriching intergenerational relationships are personally and communally.